Ah those long, summer days are finally here and I'll admit I wasn't ready. It's come up way too fast but if you feel the same way and aren't quite as prepared for those sunny days at the pool as you'd like to be, don't worry! We've got you covered with the most important products you need to enjoy every day this summer, especially those spent by the pool. With these sustainable and eco-friendly products, you can look good, feel good and play good this summer. What's better than that? Not much! So let's get summer rolling with these five fantastic products that are must-haves for you this summer! How they give back: Reformation makes their products out of “super sustainable materials” and as their company grows, they hope to continue to create more sustainable and renewable fabric options. A few examples of the materials they use are: Tencel, Viscose, Modal and Recover. Tencel (which is almost identical to cotton but more sustainable) and viscose are made from renewable plant materials. About 2-5% of their products are made from re-purposed vintage clothing and close to 15% are made from “deadstock” fabrics. Reformation buys old, leftover, over-ordered fabrics from other fabric warehouses to prevent waste too! You can learn more about their sustainable practices here. How they give back: The Little Market was previously featured in our Women’s Fashion blog post (LINK) but who says we can’t feature them again? Their slogan is “a nonprofit founded by women to empower women” where your purchases help provide meaningful income for these talented artisans and their families through a network of cooperatives and social enterprises. All items are fair trade and ethically sourced and they continue to build sustainable partnerships with artisans worldwide and connecting them with customers through their online marketplace. 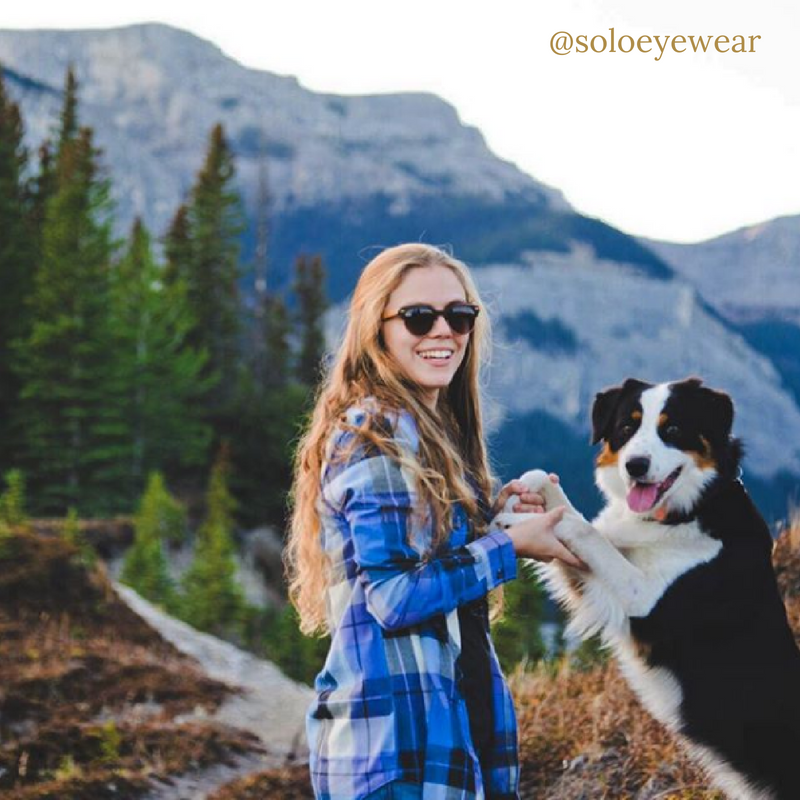 How they give back: SOLO is committed to not just being another sunglasses company, but something more. That’s why they donate 10% of their profits to restoring vision in funding eye exams, eye glasses and cataract surgeries for 13,000+ people. Their products are made with re-purposed bamboo or recycled plastic. SOLO only uses products that have been ethically sourced from manufacturers who have passed a comprehensive audit. How they give back: Badger Healthy Body Care is a small, family-owned company and became a B-Corporation in 2011 and they are passionate about running a business that is fair and profitable. Badger products are fair trade certified and are certified organic and has Non-GMO products including this sunscreen. Specifically, this sunscreen is also reef-friendly, biodegradable and cruelty-free. How they give back: Gallant International makes their fair trade organic cotton accessories and bags inside a Fair Trade USA certified factory. These bags are not only reusable and eco-friendly but 100% customizable! Your purchases help make a difference in alleviating poverty, creating a healthier environment with toxin-free ingredients, enriching the lives of farmworkers, and supporting a sustainable and eco-friendly product industry.